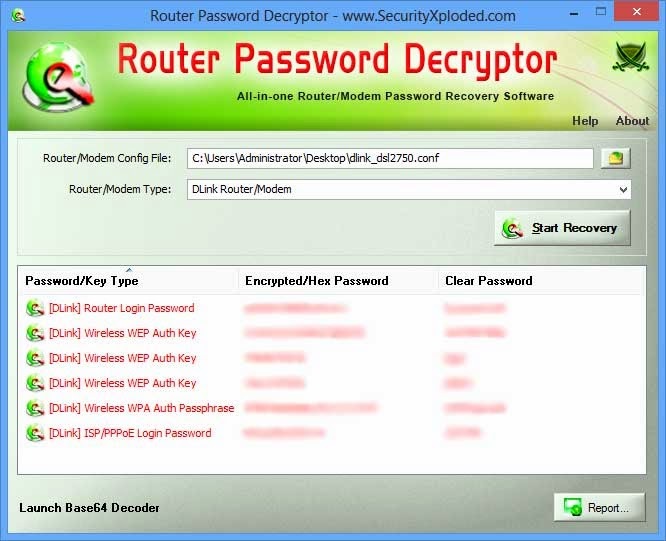 Router Password Decryptor is the FREE tool to instantly recover internet login/PPPoE authentication passwords, Wireless WEP keys, WPA/WPA2 Passphrases from your Router/Modem configuration file. In addition to this, it also has unique 'Smart Mode' feature (experimental) to recover passwords from any type of Router/Modem configuration file. It detects various password fields from such config file (XML only) and then automatically try to decrypt those passwords. It also has quick link to Base64 Decoder which is useful in case you have found Base64 encoded password (ending with =) in the config file and automatic recovery is not working. It is very easy to use tool with its cool GUI interface. Administrators & Penetration Testers will find it more useful to recover login passwords as well as wireless keys from the router configuration files. It is fully portable and works on both 32-bit & 64-bit windows platforms starting from Windows XP to Windows 8. Includes Installer for assisting you in local Installation & Uninstallation.